Changeling knight in the court of the Duke of Shadowed Hills, October "Toby" Daye has survived numerous challenges that would destroy fae and mortal alike. Now Toby must take on a nightmarish new assignment. Someone is stealing both fae and mortal children—and all signs point to Blind Michael. When the young son of Toby's closest friends is snatched from their Northern California home, Toby has no choice but to track the villains down, even when there are only three magical roads by which to reach Blind Michael's realm—home of the legendary Wild Hunt—and no road may be taken more than once. If she cannot escape with all the children before the candle that guides and protects her burns away, Toby herself will fall prey to Blind Michael's inescapable power. Seanan McGuire is a California-based author with a strong penchant for travel and can regularly be found just about anyplace capable of supporting human life (as well as a few places that probably aren’t). Early exposure to a vast number of books left her with a lifelong affection for the written word, and led, perhaps inevitably, to her writing books of her own, starting somewhere around the age of eleven. The October Daye novels are her first urban fantasy series, and the InCryptid novels are her second series, both published by DAW and bother of which have put her in the New York Times bestseller list. Seanan was the winner of the 2010 John W. Campbell Award for Best New Writer; Rosemary and Rue, the first novel in the October Daye series, was named one of the Top 20 Paranormal Fantasy Novels of the Past Decade; and her novel Feed, written under the name Mira Grant, was named as one of Publishers Weekly's Best Books of 2010. She also won a Hugo for her podcast, and is the first person to be nominated for five Hugo Awards in a single year. 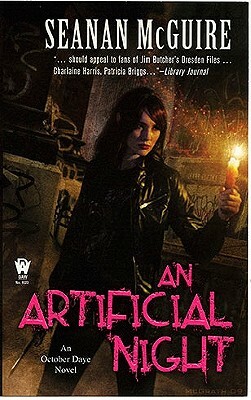 You can visit her at www.seananmcguire.com.